Starting tomorrow, Bottleneck Gallery is selling a beautiful, officially licensed poster for Star Wars: The Force Awakens by Gabz, aka Grzegorz Domaradzki. It’s available in two editions and is a perfect compliment to his previous trilogy poster. Licensed by Lucasfilm and Acme Archives, the regular is a timed edition, meaning they will print as many as possible between noon EST April 6 through 11:59 pm EST April 9. It’s 24 x 36 inches and costs $50. The variant is limited to 250 and costs $60. The poster just has a very classic, very striking look to it. 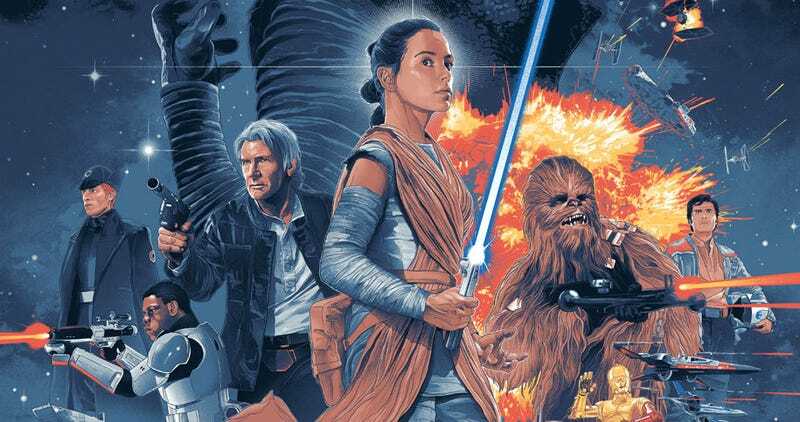 Very Star Wars, and it also gives a more hand drawn spin on the official one-sheet, which some people criticized for being a bit photoshopped as opposed to the Drew Struzan posters of the prequels. Here’s a cool video for the poster too. You can find out more information and make purchases at this link: bottleneckgallery.com.